As to this problem, users have to deleted files or uninstall program to get more free space in order to make sure normal working of Windows operating system. However, deleting file is not the easiest or desired solution, because some users are not willing to remove certain file or application, and sometimes, the deletion of vital file may lead to system crash. So the best solution is that enlarge system partition by way of transferring free space from other partition to C partition. For example, if system partition is 30G, but partition (D:) has a total 500 GB only with 200GB disk space untaken. Thus we can permanently fix this problem by allocate 50GB from (D:) to (C:) with the help of free partition manager– PartitionGuru. This program is able to resize partition without losing data. PartitionGuru is reliable and versatile partition management and data recovery software for computers or laptops which install Windows XP, Vista, 7, Windows 8, Windows 8.1, 2000, 2003, etc. both 32 bit and 64 bit. It allows users to resize or split partitions without data loss as well as advanced technology for converting partition table style, converting dynamic disk to basic disk, sector editor, back sector checking and repairing, permanent erase data, file recovery, system backup & restore, etc. With all-sided functions, PartitionGuru comes with powerful disk partition management on Windows PC, Servers and virtual disks. It has never been so easy to extend/shrink/split partition without losing data or doing harm to partition. How to resize system partition without data loss? First download and install PartitionGuru to computer or USB drive. Step 1: Launch PartitionGuru by double clicking its icon and you’ll get is main interface. 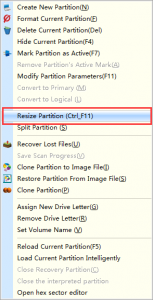 Step 2: Right click partition (D:) and select the item “Resize Partition”. 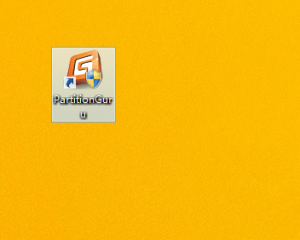 Step 4: Click “Start” button to start the process of resizing partition. Note that the operation relates to system partition and the rest operations will be done by its DOS version of PartitionGuru automatically. This entry was posted in Partition Manager and tagged free partition manager, move partition, resize partition, split partition by EASSOS. Bookmark the permalink.